SPRING ARBOR, Mich. – Grace’s women’s basketball team snapped its slump with a 66-49 pounding of Spring Arbor on Wednesday. The Lady Lancers (10-12, 4-6 Crossroads League) ended a four-game losing skid — all games against teams in the NAIA poll. Grace displayed a formidable defensive effort on Wednesday, forcing SAU into 21 turnovers. The Cougars (7-15, 3-7 CL) also shot just 32 percent for the game compared to 43 percent for Grace. Brooke Sugg stuffed the stat sheet with 18 points, 6 rebounds, 4 assists and 3 steals. Vironnica Drake added 16 points, 5 boards and 3 assists, scoring all of her points after halftime. In the first quarter, Grace made a late surge to gain separation from SAU. Grace held a slight 10-9 lead, but the Lady Lancers erupted for 11 points over the final three minutes. Five different players for Grace scored during that run, aiding the Lady Lancers to a 21-13 lead after 10 minutes. Grace’s defense was dominant in the second quarter. The Cougars had almost as many turnovers (6) as they had points (7). The Lady Lancers’ offense only scored eight points, however, but Grace still led 29-20 at halftime. Grace led by nine despite shooting just 1-of-8 from beyond the arc. Sugg led all players with 12 points, and Brooke Treadway added eight points in her first start of the year. Both offenses unlocked in the third quarter; the teams combined to score 43 points in the fast-paced period. Drake proved to be especially lethal in the period, scoring nine points on a myriad of drives. Sugg buried a 3-pointer late in the quarter, and Grace maintained a 51-41 lead by quarter’s end. 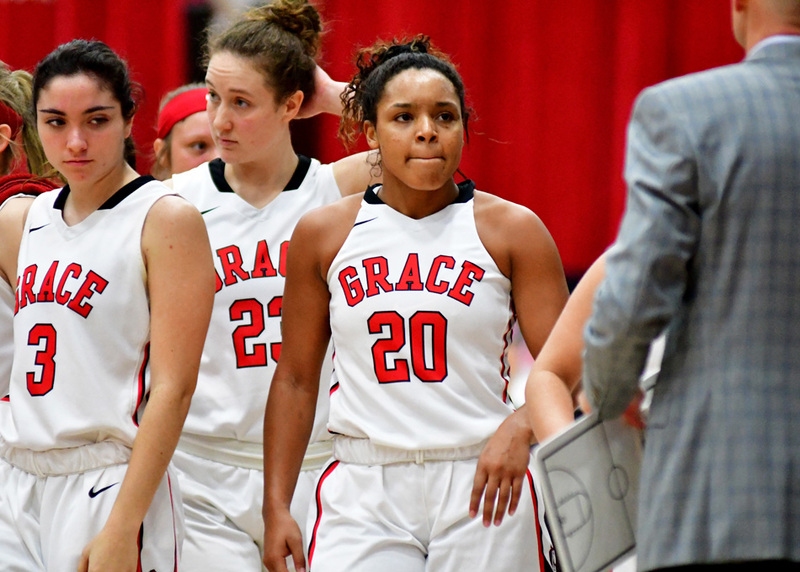 Early in the fourth quarter, Grace scored 10 unanswered points thanks to a pair of steals. Kyannah Stull and Sugg both buried 3-pointers, and Drake made two layups to put Grace on top by 17. Grace cruised to the final buzzer for the final 17-point margin of victory. Stull did not miss in the game. She shot 4-of-4 overall, 3-of-3 from downtown and 1-of-1 from the free throw line for 12 points and four rebounds. Treadway finished with 8 points, 8 rebounds and 2 steals. Lauren Godfrey scored six points, and Pam Miller added four more. The Lady Lancers face another long road trip on Saturday, playing at Mt. Vernon Nazarene at 1 p.m.